Butwal: As part of an ongoing effort to revamp technical and vocational education and training (TVET) in Nepal, a policy dialogue team has been holding discussions with stakeholders across the country. The team—comprising representatives of the Ministry of Education, the Council for Technical Education and Vocational Training (CTEVT), UNDP’s Support to Knowledge and Lifelong Learning Skills (SKILLS) project and a number of TVET experts—has been using these programmes as a platform to receive feedback to inform a comprehensive review of the provisions in the existing TVET Policy 2012. 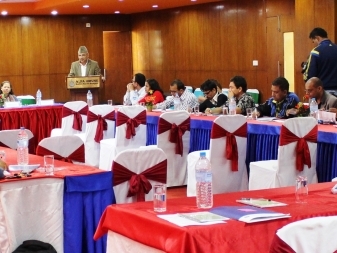 The most recent iteration of these consultations took place in Butwal in Rupandehi on 18 June, which brought together diverse participants, including the Assistant District Education Officer, principals, administrative heads, teachers, coordinators and instructors of different technical institutes, private technical schools, nursing colleges and community/public schools offering technical courses. At the event, the policy dialogue team shared inputs collected in previous such programmes recently held in several eastern Nepal districts. As part of his presentation, one of the experts, Dr. Hari Pradhan, also highlighted TVET-related policies in other South Asian countries, and pointed out potential lessons that Nepal could glean from these going forward. Divided into groups, the participating stakeholders presented their views with regards to the gaps in the aforementioned policy and possible interventions to address these. Most groups maintained that although more government and private technical institutes should certainly be opened, the reformed TVET policy should stress on the quality of the programmes provided to students and ensure that women, people from marginalized communities and remote areas have access to these, since they are truly in need and would benefit greatly from the opportunity. Suggestions included more scholarships, hostel facilities and other benefits to attract women and students from vulnerable groups to technical courses. Participants also suggested that instead of seeking to furnish TVET trainings free of cost, students should be given soft loans by the government and private technical institutes, which could then be paid back once they have joined the workforce and begun earning. As far as the state of TVET curriculum is concerned, stakeholders asserted that it should be made more job-oriented and market-responsive, if students are to be ensured employment at the end of the training. Having TVET schools and institutes create designated job-placement units was proposed as one possible solution to this. Ranking of technical colleges based on their job-placement rates and career services was also suggested. In a similar vein, participants stressed on the need to make on-the-job training (OJT) in private companies more effective, with one group calling for a clear government directive on the matter. Teachers and instructors associated with government-run technical institutes, meanwhile, demanded better options and job security, as well as learning opportunities such as Training of Trainers (ToTs), among others, to keep them abreast of advancements in their field. They also suggested the formation of one polytechnic university in each federal province of Nepal specializing in engineering and applied sciences. © 2019 Support to Knowledge and Lifelong Learning Skills (SKILLS) Programme. All Rights Reserved.